Here is a Shamshir, or at least what I would call a Shamshir. Blade is 1075, cut and ground from a scrap bit of steel I found at John's, the handle had to be forged to get the bulb shape though. It got real warpy in HT but John managed to fix it (this was AWHILE ago, almost 1 1/2 years). I recently visited John and picked up some blades and this was among them, and today I decided to finish it up. Handles are green G10, which is a high tech sort of material like carbon fiber or micarta, 3 brass pins with a thin wire wrap at the top of the handle. The blade, handle and guard are all antiqued to make it look like...uhhhh.. an antique. Comments and critique welcome. Hey that looks good enough to start a whole new Guild or Re-enactors: Guild of Saladin maybe? Thanks Charlotte! I am down with that, would be cool to do period warmaking kit of middle eastern peoples. Width at the base of the blade is 1 1/4", one inch from the tip it is 5/8"
No not at all, I will see if I can get a top down shot, it is nice and oval and the lower lobe tucks under your hand and it is a snug fit. I've actually seen a shamshir swung by someone who knew what he was doing. It's used with a loose wrist and large arc so the knot on the end of the handle hangs in the hand to keep the weapon from sailing away at the wrong moment. The blade swings in a big circle and slashes - very effective against an unarmored foe or an enemy's horse. You are a prolific little dickens aren't you? And that's just what they were made for, slashing on unarmored horses and opponents. To the extent of my limited knowledge, I don't think heavy armor was very common in the arid hot areas of the middle east and Mediterranean, so a sword for cutting/slashing would have been ideal. I would love to see some traditional martial arts involving swords from this area! Thats one nice blade sam. With that curve how did you heat treat it? That is a really nice sword. I think it is my favorite of yours, that I have seen. Only because I like the graceful curved shape. 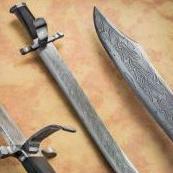 Many people make the cut and thrust type of swords, but not as many (here) make this type. Really cool, and it looks like it would mow 'em down if you could time that thing while on horseback. And yes, you are turning them out at a good clip. As a side note we should also point out that they were incredibly sharp and often made with wootz steel. As a side not it should also be noted they were also pattern welded :cool:, but I claim no historical association other than style or shape. Thanks Troy! Atleast you have kids for an excuse, I haven't even forged one sword this whole year either!